Banshee is an also very good option for Linux users to play music and videos. Keep up with your podcasts and Internet radio. Discover new music and podcasts. Keep your portable device loaded with good stuff. 1. Sync your music and videos to your Android, iPod, iPhone, or other device. 2. Set a bookmark on any song, video, or podcast so you can return to it later. 3. Control Banshee through a small window with only playback controls and track information. 4. Subscribe to podcasts and stream or download episodes. 5. Create playlists that automatically include any matching tracks. 6. Browse and search the Internet Archive’s vast media collection. 7. Browse and listen to music shared over your local network. 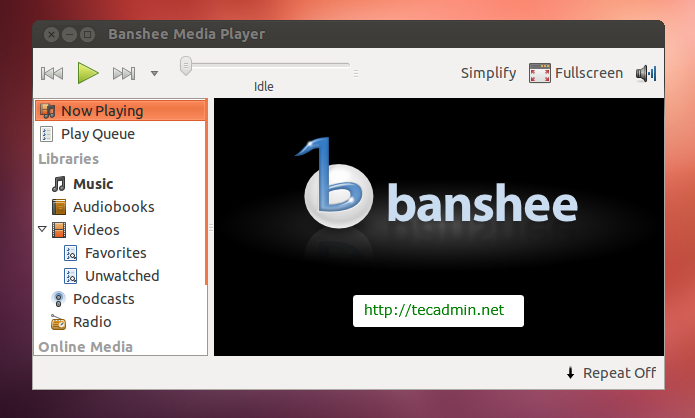 Use following set of commands to install or upgrade Banshee media player on your Ubuntu systems. To start Banshee player use GUI icon or use following command to start it and enjoy audio/videos. Congratulation’s! you have successfully installed Banshee media player on Ubuntu.